2018 ASHRAE Handbook | Zero Zone, Inc. 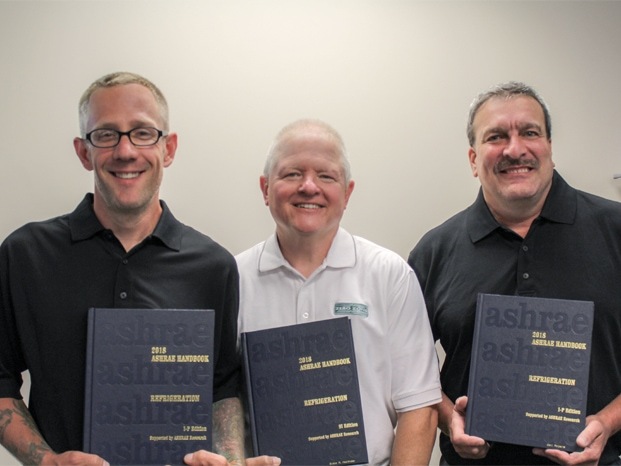 Zero Zone Engineers Contribute to 2018 ASHRAE Handbook – Zero Zone, Inc.
Three Zero Zone engineers received special recognition from ASHRAE for their extensive contributions to the 2018 ASHRAE Handbook (from left to right): Mike Chieffo, Compliance and Engineering Analyst; Bruce Hierlmeier PE, Director of Regulatory Compliance and Refrigeration Technology; Carl Roberts, Engineering Lab Manager. Hierlmeier and Roberts have participated for over 20 years, and Chieffo joined for his first effort. These three men account for the largest representation from an individual refrigeration manufacturer. Their efforts focused on adding technical information and omitting obsolete data from two chapters: “Retail Food Store Refrigeration and Equipment” and “Food Service and General Commercial Refrigeration Equipment.” Their additions reflected recent technology developments, new regulations, and the shifting mindset of industry leaders, with an emphasis on sustainability and energy efficiency. Topics included design enhancements and new refrigerants, such as high glide refrigerants, propane, and CO2—particularly in transcritical mode. Zero Zone is proud of their combined efforts for the 2018 ASHRAE Handbook, which is used as a reference by refrigeration engineers and government agencies that write regulations.